The first conversions from conventional to organic farming took place during the 1960s, but significant numbers of farmers only began organic farming in the last ten years or so. Most organic farmers are found in the Walloon Region, where conventional farming in the hilly region is already extensive (mostly pastures for dairy production), enabling farmers to be certified organically without major changes in their farming practices. Conventional agricultural practices in the northern part of the country, the Flanders Region, are rather intensive, especially in the case of production of fruit and vegetables. Although fewer farmers have converted to organic farming so far in this part of the country, a recent policy adjustment, in which subsidies per hectare for organic vegetable production more than tripled in Belgium, is expected to lead to a significant increase in the number of organic farmers in the Flanders Region over the next few years. In 1999, the number of organic farmers was 550 (Table 1), while it increased to 636 during the year 2000 (an increase of almost 16 percent) (Ministry of Agriculture, 2001). Besides these organic farmers, 571 certified organic enterprises are found: 529 wholesalers, packers, distributors, etc. with the remaining being importers (42). Despite the growth rate observed during the last decade (average annual growth rate of about 20 percent), organic farming is still a small sector in Belgium, accounting for about 1 percent of total area under agricultural production. During the year 2000, the total area under organic production increased from 18 515 hectares to 20 663 hectares (an increase of almost 12 percent). The highest growth was in organic pasture land. The area under organic horticultural production (including flowers) accounts for 3.6 percent of the total organic surface (751 hectares (Table 2)) (Ministry of Agriculture, 2001). Source: Ministry of Agriculture, 2001. The main part of the certified organic area is dedicated to pastures for dairy farming (about 75 percent). The second main usage is cereal production (9 percent of total organic area). Organic production of fruit and vegetables is modest (3 percent), and is mostly found in the Flanders Region. The distribution of the area under organic fruit and vegetable production per region is given in Table 3 (1999). The most common products among vegetables are potatoes, carrots, cabbage and onions, while apple is the main organic fruit produced, followed at a distance by pears. Quantities per product could not been obtained. In Belgium, Council Regulation (EEC) No. 2092/91 applies for organic farmers, processors, traders, etc. The state authority for organic farming is the Ministry of Agriculture (Direction Générale 4 (for plant production) and Direction Générale 5 (for animal production)). The Ministry recognises two inspection bodies: Blik and Ecocert. Both are accredited according to EN 45005 and EN 45011. Farmers and processors who meet the private standards of Biogarantie and Nature & Progrès (in addition to the official standards for organic production) may use the labels Biogarantie® (mainly used in the Flanders Region) and Nature & Progrès (used in the Walloon Region, see Figure 1) (Heuschen, 2000). Direct support for organic farmers has been granted since 1994 by the Belgian Government. In 2001, the annual subsidy per hectare for vegetable production more than tripled, from €300 per hectare to €930 (during the first two years of conversion, average figure) (see Table 4). The other support amounts have not been changed. Source: Ministry of Agriculture (2001). Other state support activities include co-financing of two research centres for organic agriculture: (i) Proefcentrum voor de biologische teelt (PCBT) (in the Flanders Region); and (ii) Centre technique pour le développement de lagriculture et de lhorticulture biologique (CEB) (in the Walloon Region). These centres concentrate on field experiments of organic agriculture. As the above has made clear, despite remarkable growth figures over the last years, organic farming in Belgium still represents only one percent of total agricultural production. In the northern Flanders Region intensive conventional production methods require a major change in farm management if converted to organic farming. The subsidy per hectare supported by the Belgian Government has not been sufficient to attract many farmers. In 2001 the premium per hectare for vegetable production more than tripled. It is now expected that also the northern part of the country will become more organic. However, organic production lags behind demand. Bearing in mind the conversion period of three years, it will not be before 2004 that national production of organic vegetables could catch up with demand. Therefore, a significant share of Belgian organic vegetable consumption is likely to continue to be imported. One problem identified by various market operators is the lack of organic spirit among farmers. Many of the farmers interested in conversion are said to be interested in the level of the subsidy per hectare only, instead of seriously committing themselves to other farming practices. Many see an attractive income alternative for the short term, but do not look at the longer term. This observed lack of commitment might result in a large number of newly converted farmers not continuing organic farming after a few years. The total value of organic sales in Belgium are estimated at BF6 billion (2000), of which about one quarter is organic fruit and vegetable sales. Although organic products have been sold on farms and in some specialized organic shops since the first farmers started producing organically in the 1960s, the awareness of most consumers of the availability of organic fruit and vegetables started once the main supermarket chains included these products in their assortment, about 10 years ago. The first retailer to carry organic products was Delhaize, which started in 1989, followed by Colruyt and GB (now owned by French retailer Carrefour) in 1991. Those supermarkets requested the organic products to be (at least) of the same quality as non-organic products, not accepting any inferior physical appearance of the product. Moreover, the taste of the organic products had to be as good (or better) compared to the conventional products. Initially, only a few products were displayed, namely those readily available after the domestic production season (mostly vegetables with a longer shelf life, such as potatoes, carrots and onions). Gradually, over the last 10 years, more and more products and varieties have been included, and the availability throughout the year (including imports during the off-season period) has increased, resulting in a current annual supply of over 50 fresh fruits and vegetables. However, the initial products mentioned above (potatoes, carrots, onions) remain the ones with the highest sales volumes. The strongest growth of the Belgian organic market has been observed in the second half of the 1990s, especially during the last three years (1998-2000). Fuelled by major food scares, including the dioxin crisis that hit Belgium hard, the organic market boomed. Immediately after the outbreak of the dioxin crises in 1999, in which high levels of dioxin and other toxics were found first in chicken meat and eggs and later in other foodstuffs as well, organic sales were up 80 percent from the preceding year. Average annual growth rates of 50 percent were observed during the 1998-2000 period. No statistical data on processing and marketing of organic products, or on their development, is available (Heuschen, 2000). Therefore, what follows is based on information obtained through face-to-face and telephone interviews with traders and retailers. Total sales of organic fruit and vegetables in 2000 were estimated at BF1.5 billion (€37.2 million). This is a rather reliable estimate since most informants, both at wholesale and retail level, confirmed this figure. Total volume is estimated at around 15 000 tonnes, of which the major part (70-80 percent) is vegetables (locally grown or imported from nearby countries such as the Netherlands or France). The major sales outlet is supermarkets, at some distance followed by specialized organic shops, and lastly by other distribution channels (see section 2.3). The main products include (in decreasing order of magnitude): potatoes, apples, onions, carrots, cabbage (red and white), tomatoes, broccoli, cauliflower, bananas, and kiwi, among others (see Table 5). Figures on prices at retail level and premiums over conventional products are difficult to obtain, and vary widely among different products and during different seasons throughout the year. However, anecdotal information obtained from market sources and some non-representative samples obtained by the author, suggest that the average price premium ranges between 30 and 50 percent over conventional products, with exceptions beyond that range. These observations confirm earlier assessments of price premiums in Belgium (Michelsen et al, 1999) in which premiums for vegetables were estimated at 40 percent above the conventional price, and for fruits at 50 percent. Source: Author calculations based on information obtained from market sources. During some of the interviews it was felt that on average the price premiums have gone down over the last ten years. Many expressed the expectation that, in view of the increasing market size and the increasing number of organic producers, wholesalers and outlets, the decline in price differences between organic and conventional products was likely to continue during the forthcoming years. Distribution channels are generally short: it takes only a few handlers to get the product from the field (or import harbour) to the final sales outlet. Two wholesalers (Biofresh and Biomarché) account for an estimated 70-80 percent of all wholesales of fresh organic fruit and vegetables. Biofresh, which besides organic fresh fruit and vegetables trades in other fresh products such as dairy products, meat and vegetarian specialities, supplies only specialized shops (no supermarkets). Out of the total 700 of these outlets, over 50 percent are supplied by Biofresh. Biomarché, specialized in fruit and vegetables, is the only supplier of Delhaize, a supermarket chain. Biomarché has some packaging lines, where the organic products which are bought in bulk, are packed in bags, nets and trays (legislation requires organic products sold in outlets where also conventional products are available to be packed separately). Other distributors include Brava (a cooperative with about 50 farmers under contract) and some small companies. In 2000, an estimated 60-70 percent of all organic fruit and vegetables was sold in supermarket chains (almost 10 000 tonnes with an estimated value of €24 million or BF975 million, see Figure 2). The major part of this is sold by Delhaize, which accounts for an estimated 30 percent of total organic fruit and vegetables sold in Belgium. The other two main supermarket chains selling organic products are GB and Colruyt. These three supermarket chains have their own organic brands, of which the logos are shown in Figure 3. An estimated 25 percent of organic fruit and vegetables is sold in specialized shops (3 750 tonnes with an estimated value of €9.3 million or BF375 million). The remaining are farm sales, subscription schemes, weekly markets and so-called food-teams (groups of consumers, mostly neighbours, buying collectively organic products). New in Belgium is the organic supermarket, which only sells organic products. 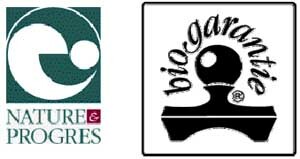 In March 2001 the first organic supermarket called Bio Square was opened in Uckel, an economically wealthier neighbourhood of Brussels. The relatively small shop (120 m2), which operates under the logo of Delhaize, is expected to be the first in a series of five fully organic outlets, to be operational before the end of 2002. At the time of writing of this report (mid 2001), Bio Square has been open for about four months, and sales are said to be four to five times higher than expected. The main problem faced is supply to the shop, i.e. logistics. Another supermarket chain, Colruyt, is said to have a similar initiative forthcoming. The profile of organic consumers has not yet been studied (Heuschen, 2000); at least no studies are publicly available. However, in an issue of BioVisie (Blivo, 2000), the quarterly magazine of the organic sector in the Flanders Region, two questionnaires concerning organic food products (not just fruit and vegetables!) are quoted. Although the outcomes of the research does not necessarily fully reflect the attitude of all Belgian consumers towards organic products (respectively 1 000 and 750 persons replied), the results give some useful indications. More than half of the respondents (55 percent) buy no (or almost no) organic products. The most important considerations when purchasing a product (both organic and conventional) are the price and its freshness, followed by the physical appearance and taste. Whether the product is organic or conventional comes after these aspects in the consumers choice. Sixty percent of the respondents said that the Belgian dioxin crisis (see 2.1) had no influence on their purchasing behaviour. However, 20 percent replied that the crisis had changed permanently their purchasing behaviour. The remaining 20 percent bought more organic products during the crisis, but their organic purchases decreased slowly after the scandal, eventually reaching pre-crisis levels. About half of the respondents are not familiar with the Biogarantie label (the label used in the northern part of Belgium where the assessments took place). Organic brands are generally not known (over 55 percent of respondents do not recognize an organic product). Many others have doubts about the reliability of the organic labels. More than three-fifths consider the price of organic products too high. The report concludes that it is a likely that the number of organic clients is not increasing very fast, and that the market growth comes mostly from more purchases per organic consumer. Anecdotal information obtained from market sources suggest that the typical organic consumer belongs to the higher educated, higher income strata, often having young children. It is no coincidence that the new Delhaize organic supermarket Bio Square is situated in Uckel, an economically wealthier neighbourhood of Brussels, where many of these typical organic consumers live. The market has been growing at growth rates of up to 50 percent over the last few years. This growth, fuelled by food scares in conventional products, is realized through a combination of higher amounts per organic products sold (partly thanks through import based year-round supply) as well as the introduction of new organic varieties. New products that recently have been launched in the organic market, include cherry tomatoes (imported from Israel and Italy), red pomelo and vacuum packed maize and red beet, among others. Monthly magazines published by the main supermarkets dedicate more and more space to organic food. In order to enhance and strengthen awareness among consumers on organic products, these magazines contain information about new products, explanations about what the organic labels stand for, and provide recipes for organic cooking. Some specialized organic shops have joined forces in this consumer-education and jointly print similar brochures. It is expected that the organic market will continue to expand rapidly, and demand will continue to surpass domestic supply. The major food scares that have hit the European continent in general and Belgium in particular over the last few years have permanently eroded confidence in conventional products among groups of consumers. However, as referred to in paragraph 2.3, about half of the respondents to a questionnaire are not familiar with the Biogarantie label and over 55 percent of the surveyed persons do not recognize an organic product. Moreover, more than 60 percent consider organic products too expensive. Based on this information it seems valid to conclude that the fast growth of organic sales in Belgium over the last years is the result of high volumes bought by one group of consumers, whereas other groups of consumers are not (yet) familiar with organic products and/or do not buy these due to various reasons, among which the significant price difference between organic and conventional fruit and vegetables is the overriding argument. Therefore, constraints to further market development include a combination of lack of awareness among certain groups of consumers and the price difference between organic and conventional products. Supermarket chains are poised to take a leading role in consumer education through their monthly magazines, but also a promotional campaign at national level could enhance consumer awareness of organic products and reduce the current lack of knowledge and misunderstanding. Moreover, the noted shortage in supply of organic fruit and vegetables, due to the low domestic production, has a slackening influence on further market growth. To what extent the low domestic supply provides opportunities for organic exporting countries, in particular developing countries, to meet Belgian organic demand, will be analyzed in Section 3. For imports of organic fruit and vegetables into Belgium, Council Regulation (EEC) No. 2092/91 applies. However, organic certification is only one of the requirements needed to enter the market. As has become evident in the previous section, supermarket chains (in Belgium by far the leading outlet for sales of organic fruit and vegetables) require high product standards as they do not accept any inferior quality or taste. Therefore, post-harvest handling and transport are key, and must ensure that the product reaches the consumer in top quality. As in most other countries where market surveys have been carried out for this publication, no official data on imports of organic fruit and vegetables exist in Belgium. In February 2001, a new project with the title "Bio-theek" was started, coordinated by BioForum, the Belgian umbrella organization for the organic sector. The objective of the project is to collect and disseminate for free the most recent data available on production, consumption, imports and exports of organic products. However, since the information is not expected to be available before early 2002, what follows in this section is an analysis of imports of organic fruit and vegetables based on interviews with importers and traders. 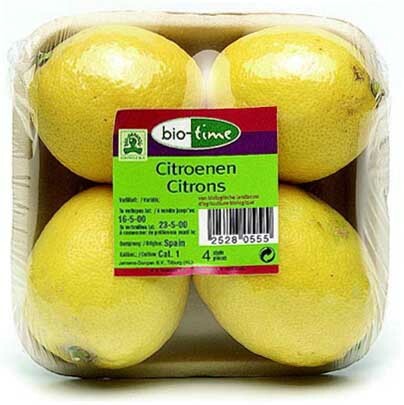 Although Belgium is a net importer of organic fruit and vegetables, re-exports do exist as well. Precise information on re-exported quantities could not be obtained. Related to this, trade flows within the European Community (EC) do not necessarily reflect the country of origin of a product. Especially in the case of the Netherlands and Belgium, which thanks to their geographical location and infrastructure are important entrances into the European hinterland. Many products imported into these countries are re-exported to other European countries. Therefore, organic fruit and vegetables imported into Belgium from the Netherlands (a major supplier to the Belgian organic market for fresh horticultural products) are not necessarily produced in the Netherlands. Belgium is home to a significant number of food processing industries, including organic processors, where fresh fruit and vegetables are processed into canned or frozen products. These industries import significant amounts of fresh organic horticultural products, but those products are not sold on the fresh organic market (and are therefore not included in the BF1.5 billion organic horticultural market value) (see Section 2.1). The market survey was carried out in late February - early March 2001, a time of the year with typically high imports, due to a lack of local supply. Some market sources provided data based on the weekly amounts traded during the market survey, from which annual totals were derived by multiplying by 52 (weeks). Obviously, the seasonality of many products is likely to cause a certain standard deviation in the total amount imported. Moreover, the unusual high precipitation in Belgium during the second half of 2000 resulted in many crops not having been harvested. Therefore, in the period when the market survey was carried out, imports were even higher than normal for that time of the year, which might result in an overestimation of annual imports of fresh organic fruit and vegetables. These points, combined with a certain reluctance among some traders and importers to provide detailed information, imply that this section is based on rough estimates. Therefore, caution should prevail when drawing conclusions based on the information provided. Table 6 gives estimated ranges of quantities of organic fruit and vegetable imports (year 2000), as well as the main countries of origin. For some products imports account for 50 percent of supply (e.g. for potatoes, onions, carrots, apples, pears, etc. ), while for other products the imported share is between 70 and 80 percent (e.g. broccoli, celery, tomatoes). Import rates for fruits such as kiwi, oranges and banana, etc., are naturally 100 percent, as no domestic production exists. Total imports are estimated to range between 10 000 and 11 000 tonnes, or about two-thirds of all organic fruit and vegetables consumed domestically. Source: Authors calculations based on information obtained from market sources. Imports from countries outside the EC other than those listed in Article 11 of Council Regulation (EEC) No. 2092/91, are registered at the Ministry of Agriculture. The information describes the imported product, the country of origin and the certification bodies involved, but does not provide quantitative information (Table 7). Source: Ministry of Agriculture, 2001 and market sources. Re-exports of organic fruit and vegetables do exist in several western European countries, including France, the Netherlands and Belgium. Belgium imports a number of products from France and the Netherlands, and it is therefore difficult to verify, especially for temperate zone products, if imports into Belgium consist of re-exports from these countries, or if these products are produced in France or the Netherlands. An example of the difficulty to analyse trade-flows include kiwifruit imported into Belgium. Information provided by the Ministry of Agriculture in Belgium, the State Authority responsible for import licenses for organic products from countries other than those listed in Article 11 (as described in Council Regulation (EEC) 2092/91), does not mention any imports of organic kiwi from New Zealand, although the fruit is readily available on the market. Zespri, a New Zealand kiwi producer and importer into Belgium, reports that it sells about one-fifth of their organic kiwis in the Netherlands, while one Belgium wholesaler stated that they buy all non-EC imports from Eosta, an organic wholesaler in the Netherlands. Therefore, it seems likely that part of the New Zealand kiwi fruit is, through the Belgium offices of New Zealand producers/importers, imported into the Netherlands, from where it continues its journey (back) to Belgium. The fruit from New Zealand is finally consumed in Belgium, but no import licenses concerning imports from non-Article 11 countries are registered at the Ministry of Agriculture in Belgium. 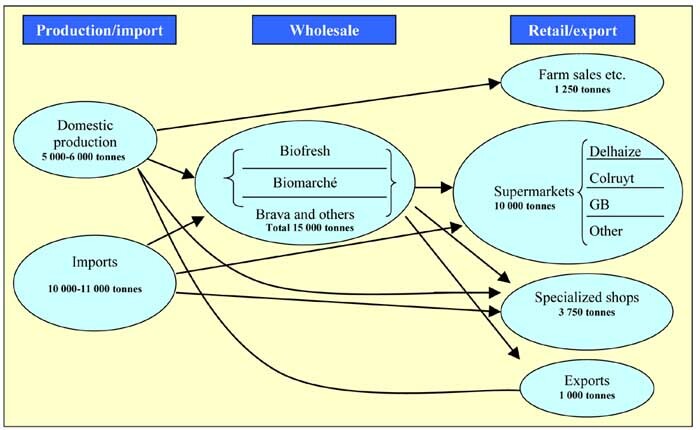 Some of the main importers include the wholesale companies Biofresh and Biomarché (see section 2). Other major importers include foreign companies such as Zespri (New Zealand), Enzafruit (New Zealand) and Capespan (South Africa). Although based in Belgium, their activities include all major European markets. De Grieck and Havenbedrijf Noord are among the bigger domestic importers. Contact details of the main importers are provided in Annex I. At first sight, no major constraints to imports exist. Demand in the Belgium organic market is expected to continue to outgrow domestic supply and therefore imports are likely to keep their prominent position in the supply of organic fruit and vegetables. Additionally, some traders referred to the ongoing discussion on the energy balance per organic product (all energy used during the lifecycle of the product: production, transport, storage, cooling, etc.) and noted that this does not necessarily discriminate against imported products. Some market sources indicated a clear preference for fresh (off-season) organic products shipped in from countries far away over domestically produced products which are stored for some months in cooled warehouses (Better a fresh pear from the southern hemisphere, than a domestic pear which has been stored for 4 months). Despite the high percentages of imported organic fruit and vegetables, one should note that the main part of imports originates from other European countries. Therefore, prospects for third countries to export to the Belgian market do exist, but for certain products and during certain months face strong competition from European organic supply. The major food scares that have hit the European continent in general and Belgium in particular over the last few years have permanently eroded confidence in conventional products among groups of consumers, resulting in fast growth of the organic horticultural market over the last three years, with annual growth rates of 50 percent. Demand for organic fruit and vegetables in Belgium has outgrown domestic supply, resulting in significant imports over the past decade. A relatively small number of Belgian farmers have converted away from conventional farming practices so far and although a recent policy adjustment, in which subsidies per hectare for organic vegetable production more than tripled, is expected to lead to an increase in domestic organic supply, imports are likely to remain the main source of fresh organic fruit and vegetables. Despite the generally high percentage of organic imports in Belgium, most of these products are imported from other European countries, such as the Netherlands, France, Italy and Spain. Imports from outside the EC are much smaller, and include countries like Morocco, Egypt, Israel, New Zealand, Argentina, the Dominican Republic, Burundi and Rwanda, among others. The best commercial prospects for developing countries organic horticultural exports to Belgium are seen for off-season temperate products as well as for exotic fruits. It should be stressed that the combination of organic certification requirements, the controls involved, and the high quality requirements of the products taste and physical appearance make professional post-harvest handling, storage and transport key features, in order to succeed in delivering fresh organic products in top condition to the Belgian consumer.